The lists below show records from 1953 to 2009 of "rare" species currently on the Irish Rare Birds Committee's Appendix 1 ("species requiring substantiating details") or Appendix 2 ("supplementary accreditation species"). 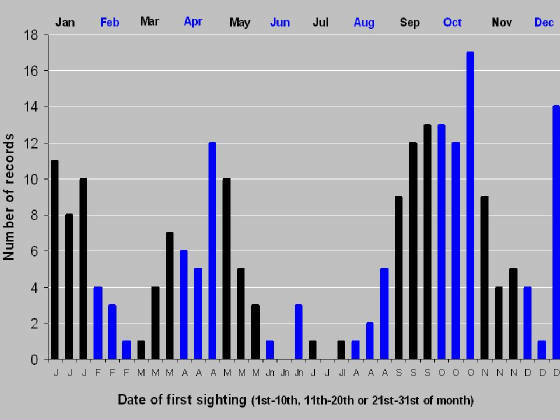 Only the first recorded date for each individual is shown in a given season, but some returning (or probable returning) individuals are shown for multiple seasons. All 1953-2006 records have been published in the relevant Irish Bird Report or Irish Rare Birds Report, with the exception of records flagged "*" (records as yet unsubmitted for formal verification by the IRBC). Records from 2007-2009 are pending formal acceptance by IRBC. Records currently shown total (by month): 20 (Jan), 9 (Feb), 12 (Mar), 23 (Apr), 18 (May), 4 (June), 2 (July), 9 (August), 37 (Sep), 43 (Oct), 18 (Nov), 19 (Dec). Added 12 May, updated/corrected 27 May 2009.